Mini fashionistas can kick it in style with fringe boots. Thanks to teen style icons like Ashley Tisdale and Miley Cyrus, fringe boots for kids are all the rage. Fringe boots are everywhere. From Hollywood's red carpet to junior high classrooms, girls who want to look trendy and chic are sporting fringe boots. The warm weather footwear for kids was first introduced in the 1960s. However, they've made a fashion comeback in the 21st century, and now the comfortable hippie-inspired boots are a hit with kids of all ages. Kids love the comfortable fit of fringe boots and parents love the stylish footwear's versatility and durability. 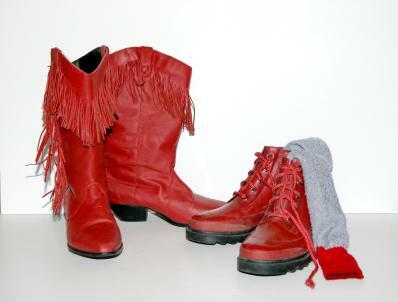 Due to their immense popularity, fringe boots for kids are readily available in most major department stores and online. In addition, they come in a variety of sizes, colors and styles. These days it's not hard to find a pair of purple ankle fringe boots for children as young as 10 months old, all the way up to tweens and teens. Bloomingdale's: The high-end department store carries fringe boots for children by Ralph Lauren. The tall suede boots feature layers of fringe and a comfortable rubber sole. GAP Kids: GAP Kids carries an adorable pair of ankle fringe boots for girls. The layered fringe detail, round toe, and soft suede finish add to the warmth and comfort of these stylish stomps. Nordstrom: Nordstrom carries a full line of Minnetonka fringe boots for children, including a layered fringe side-zip moccasin boot accented with flower-shaped ornaments along the braided collar. The trendy boots feature a rich suede exterior and interior, and a sturdy rubber sole. Ciao Bimbi: Your little girl will twirl with delight in Ciao Bimbi fringe boots. The ultra comfortable footwear features a suede upper, breathable leather lining and textured rubber outsole. While fringe boots can turn an ordinary outfit into a kicked-up ensemble, you want to avoid going overboard with them. Do not pair fringe moccasin fringe boots with a Native American-inspired mini and fringed shirt unless you are going somewhere that requires a costume. Rather, pair a simple white T-shirt with a flowing skirt with fringe boots to create a more subdued look.In addition, while fringe boots for children come in a variety of styles from traditional cowboy to rhinestone-studded pairing them with sweat pants and Daisy Dukes may not convey the right fashion message. Kids fringe boots are hip and happening footwear. Some consider them a funkier version of Uggs. Regardless of how you categorize them, fringe boots for children are incredibly versatile. Knee-high fringe boots can be worn in colder weather while ankle versions can be paired with spring and summer apparel. Bottom line: Fringe boots are a worthy investment for kids of all ages.